In Himalayan iconography she personifies the whole collection of prajnaparamita sutras, including the Heart Sutra. She is sometimes known under the title, The Mother of All the Buddhas. 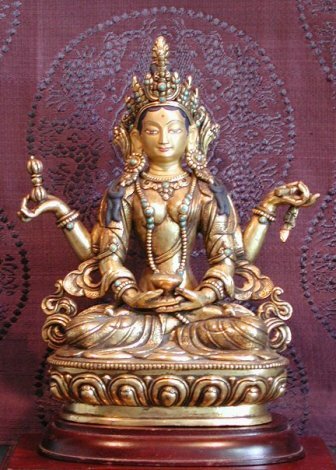 Statue made in Nepal by Siddhi Raj, a twentieth century Tibetan artist who practices in the Vajrayana tradition of Buddhism. 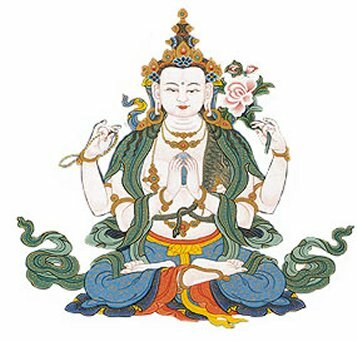 Addressed in this way, noble Avalokiteshvara, the bodhisattva mahasattva, said to venerable Shariputra, "O Shariputra, a son or daughter of noble family who wishes to practice the profound prajnaparamita should see in this way: seeing the five skandhas to be empty of nature. Form is emptiness; emptiness also is form. Emptiness is no other than form; form is no other than emptiness. In the same way, feeling, perception, formation, and consciousness are emptiness. Thus, Shariputra, all dharmas are emptiness. There are no characteristics. There is no birth and no cessation. There is no impurity and no purity. There is no decrease and no increase. Therefore, Shariputra, in emptiness, there is no form, no feeling, no perception, no formation, no consciousness; no eye, no ear, no nose, no tongue, no body, no mind; no appearance, no sound, no smell, no taste, no touch, no dharmas, no eye dhatu up to no mind dhatu, no dhatu of dharmas, no mind consciousness dhatu; no ignorance, no end of ignorance up to no old age and death, no end of old age and death; no suffering, no origin of suffering, no cessation of suffering, no path, no wisdom, no attainment, and no non-attainment. Therefore, Shariputra, since the bodhisattvas have no attainment, they abide by means of prajnaparamita. This scripture has always been held in the greatest veneration in Mahayana countries. In China and Japan there are at least twenty-eight different recensions of this sacred bible of the Buddhist schools. The Prajnaparamita-Sutra is regarded as the holy mother that feeds the bodhisattva with the amrita (nectar) of prajna (transcendental wisdom), and guides him to paramita (the other shore). It is the "utmost great perfection" which gives full enlightenment to the bodhisattva after he has successfully completed the other five paramitas: dana (charity), sila (morality), ksanti (patience, forbearance), virya (energy), and dhyana (concentration). Recommended Reading: Buddhist Wisdom Books: The Diamond and the Heart Sutra, Edward Conze, London: Unwin, 1988.